We’d love your help. Let us know what’s wrong with this preview of Product Design for the Web by Randy J. Hunt. Web designers are no longer just web designers. To create a successful web product that's as large as Etsy, Facebook, Twitter, or Pinterest-or even as small as a tiny app-you need to know more than just HTML and CSS. You need to understand how to create meaningful online experiences so that users want to come back again and again. In other words, you have to stop thinking l Web designers are no longer just web designers. To create a successful web product that's as large as Etsy, Facebook, Twitter, or Pinterest-or even as small as a tiny app-you need to know more than just HTML and CSS. You need to understand how to create meaningful online experiences so that users want to come back again and again. In this breakthrough introduction to modern product design, Etsy Creative Director Randy Hunt explains the skills, processes, types of tools, and recommended workflows for creating world-class web products. 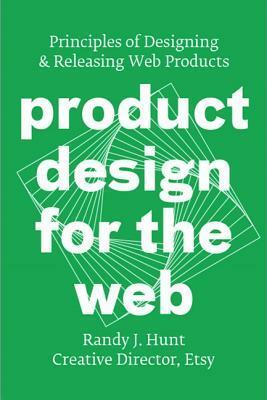 After reading this book, you'll have a complete understanding of what product design really is and you'll be equipped with the best practices necessary for building your own successful online products. To ask other readers questions about Product Design for the Web, please sign up. Looking at books for my intro to web product design course, this one was the most helpful and concise. It has easy steps for students to follow to get a basic understanding of how to get into a career as a visual product designer. It's a quick read. But after having read so many books and articles about design, I am not sure what this book added to my thoughts. I am gonna skim it through again at some point. A very handy book for beginners. A good and solid introduction in digital product design. The principles described in the book very much apply to software engineering too! I really enjoyed this book I don't know why the Amazon reviews are so bleak. I didn't know what Product Design consisted off. I knew the terminology of the word and that it's a vital role in web businesses. I've been a baby of the internet since I could remember. I always had a blog, banner rotation, tutorial websites and all those little bits I had online growing up. I never realised that all the things I did naturally to market my blog, bring traffic, update and improve it could be seen as Prod I really enjoyed this book I don't know why the Amazon reviews are so bleak. I didn't know what Product Design consisted off. I knew the terminology of the word and that it's a vital role in web businesses. I've been a baby of the internet since I could remember. I always had a blog, banner rotation, tutorial websites and all those little bits I had online growing up. I never realised that all the things I did naturally to market my blog, bring traffic, update and improve it could be seen as Product Design development! This book explains everything from the fundamentals of Randy's journey of discovering what it was and all the different skills involved. It's a subject for those who are interested in multiple areas of the creative/marketing/tech side of the business. I am definitely even MORE interested in Product Design than I was before. The process and way he talks through them are so logical it brings clarity to a very confusing and broad subject. I lent this book to my workmate who said a lot of the stuff he had to Google whilst reading so I'm not sure whether it's because I have a natural background in web products (without knowing they were web products) initially or whether it's just him. Good for anyone looking to get into or understand more about how to make digital products, otherwise nothing new. Recommended to me by a UI Engineer Lead during an interview. Good overview of big picture ideas to evolve the mindset of seeing web apps and web pages as web products. This book needed to be written and there is no more appropriate than Randy Hunt-- Etsy's creative director. With a background in graphics design and fine arts he can speak confidently about design perspectives, with web front end coding experience he can articulate the importance of knowing your materials and with a career cultivated at Easy (as opposed to some of the larger tech startups or shops); it's clear he has lived the experience of the pragmatic ship cycles within a more 'scrappy' organ This book needed to be written and there is no more appropriate than Randy Hunt-- Etsy's creative director. With a background in graphics design and fine arts he can speak confidently about design perspectives, with web front end coding experience he can articulate the importance of knowing your materials and with a career cultivated at Easy (as opposed to some of the larger tech startups or shops); it's clear he has lived the experience of the pragmatic ship cycles within a more 'scrappy' organization. Just beyond the reach of most design disciplines is a discipline that shares many of the same tools and language as many other design disciplines but instead of focusing on the artefact, the "discipline" of product design turns its gazed to the 'actualize' experience of using a product. If this sounds like splitting hairs between UX, interaction design and general graphics design who have built websites on the web-- it is. But these are important hairs worth splitting. This book is about "product design" and as a book it seeks to help others embrace the product design mindset and to embrace the tools, perspective and practices of product design. If in your experience you find a chasm between product management and design, consider this book a bidirectional bridge. This book is five stars because it fills what is a gap, in my view, in existing user experience literature. The difference between "Design" and design. That is the difference between Design as in the design studio organization and the process as which "Design" has come of age and design- the process of getting stuff done to ship compelling software as a team. This book is not a must need for everyone. If you've spent a lot of time building web products and thrive in the fast pace, consider the lessons learned. However if you are new to mobile or web design and you find the time pressures a serious threat to your being as a designer (and the quality of your work) or are a product manager working with designer(s) that expect to have a voice, but unsure how to foster design AND ship-- this book is for you. Hunt addresses this gap and names it product design. The book is pithy, it doesn't try to justify its existence by over expanding on concepts and it doesn't spend a lot of time rehashing points already made else where (such as designing with Agile). People who work on web products. More explicitly...his book is for designers and product managers who have experienced a breakdown in communication across disciplines. This book is also for designers and design practitioners living with the tensions, tradeoffs and constraints in working in an engineering organization; and finally the book is for engineers and those in engineering disciplines who want to learn how to better participate in the design process. Reading "Product Design for the Web" thorough the lens of a general design book reader, you could find any number of objections. It’s focused on specific kind of product design, especially if your practice is in a different kind of environment. It’s vague and general. It’s seems common sensical. It’s old news to those who’ve been developing software products for a living. Read it as a guide for a client services designer (especially coming from print) or a student looking to start designing appli Reading "Product Design for the Web" thorough the lens of a general design book reader, you could find any number of objections. It’s focused on specific kind of product design, especially if your practice is in a different kind of environment. It’s vague and general. It’s seems common sensical. It’s old news to those who’ve been developing software products for a living. This is a very fast, lightweight, digestible book on digital product design. I enjoyed it. However, I was left wanting more. I had hoped for more specific examples, greater depth, and more exposition. If you've been building web products for any significant amount of time (5+ years), only a few pages will surprise and delight you. Despite that, it's still worth your time to read. There are stronger books out there on the topic. This is a great prime for people from a print background, who are looking for an intro into designing digital products. For seasoned digital product designers, this book will feel shallow. Read it since it was recommended by someone in the technopreneurship circle. But it isn't upto the mark. the same theme is told a 1000 times throughout the book using different language. Needlessly bloated into 200+ pages. I did learn some cool pointers for sure, but not a great book. It's a good primer of product and UX design process. Not very in depth, but a good starting point. This book is great so far. So looking forward to the rest ofit. Not enough depth to be useful to readers who already know something about building Web products. Not enough basics to be useful to beginners. A bit thin on the ground. Offered very little insight to someone who already does a bit of this. The key insight for me was to design in terms of ux "flow" instead of an individual feature or page. I also enjoyed his advice to write the press release first. As a whole pretty cliche. Short little primer on product design. ETSYS RANDY J HUNT BRINGS THE SECRETS TO PRODUCT DESIGN.